It’s hard to believe but this will be the last blog from South Africa, where we’ve started to see clouds and even rain as the locals move from summer into autumn and tease us that they’re getting us into training for going home. Fortunately, on Wednesday we got our timing right and headed for Table Mountain on a clear day (see pic above). I’ll spare you the gory details of the drive in to Cape Town from Franschhoek, suffice it to say that the driving here is anarchic and if there are any rules, apart from no holds barred, I’ve yet to grasp them. The drivers are bad enough but you then have to factor in pedestrians, cyclists and motorbikers who make things up as they go along and give us newbies the heebie jeebies as we rack up the near misses and cardiac arrests. No wonder Christian Barnard, the heart transplant pioneer, born in the Karoo, operated here. 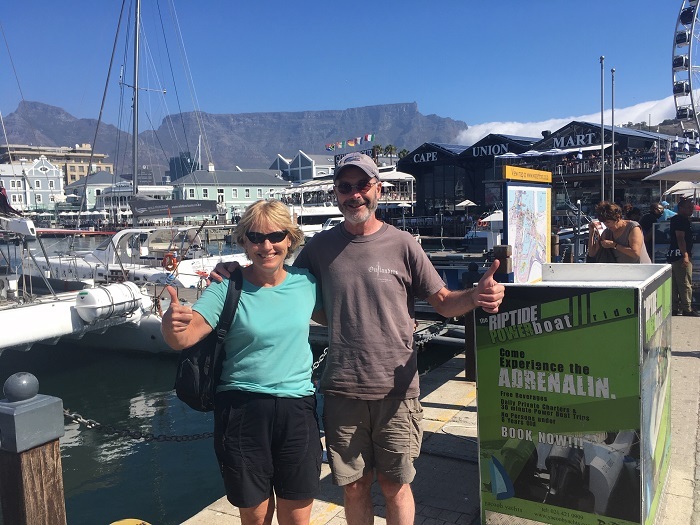 You need a stout heart and strong legs to climb Table Mountain, which towers over the city, giving views that make even the rush hour gridlock palatable and we had two people who were up to the task. Brian, Maureen’s husband, is an old hand at this particular game and he led Gillian Stewart, inveterate of Inverness, a multi Munros bagger back home in Scotland, to her first ascent. Gill and Brian, adrenalin junkies, back at sea level after climbing that big rock in the background. Pam Valentine, the former Wales international who is heading home to become ladies’ captain at Wrexham, decided that the cable car was the sensible route to the top and I agreed. There’s a squats machine at the gym near the house but developing the leg power to climb Table Mountain probably needs a bit more than looking at said machine and pondering how exactly it works. Anyway, Pam and I had already had a busy week having driven to Hermanus and on to the Cape of Good Hope on Monday and played golf at Metropolitan, slap bang in the middle of Cape Town, on Tuesday. We didn’t play here but called in and did some shopping! 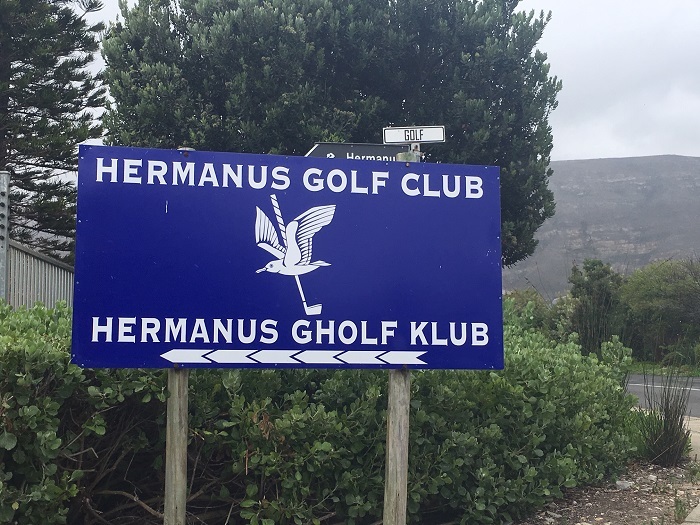 It was a murky old day for most of Monday and it was hard to tell the sky from the sea at Hermanus, so we called in at the golf club, a proper, old-fashioned sort of place that was hiving despite the persistent drizzle. Pam and I both made slightly daring purchases, helping to keep Annika in the style to which she has become accustomed. 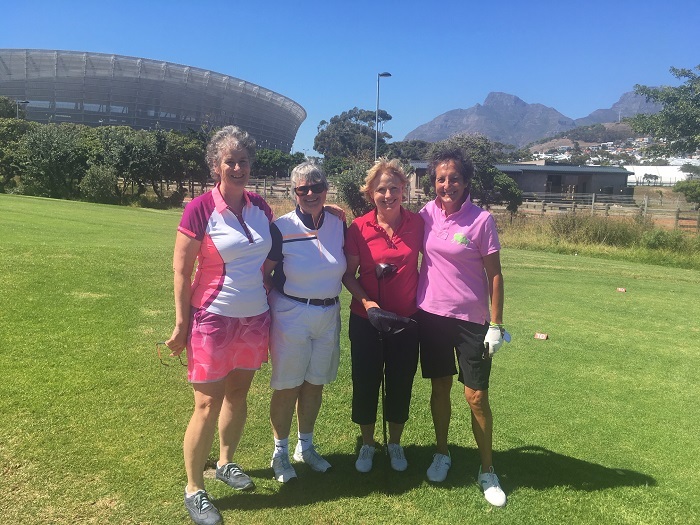 The next day, at Metropolitan, a 9-hole course that is a bit more than that, Pam, Gill and I were guests of Tegwen Matthews, capped numerous times by Wales and GB and I and now resident in South Africa. Wales managed an honourable half with the northern Celts thanks to Teg’s majestic near 2 at the last, an intimidating par 3 guarded by water and bunkers. Though how anyone of her calibre can be playing off 7 and getting a shot is beyond me! Sisters in arms. Patricia, Pam, Gill and Teg at Metropolitan. Sadly, frustratingly, Maureen’s back prevented her from travelling down let alone playing, which was a shame because she, Teg and Gill had last played together for GB in the Commonwealth Tournament at Lake Karrinyup in Perth (Australia) back in the early 1980s. Young though we look, Teg, Pam and I had all played in the junior home internationals at North Berwick in – wait for it – 1971. Gill’s a bit younger, so didn’t play for Scotland until later. The others trained on to bigger and better things but the great thing is that we’re all still playing and enjoying our golf in beautiful places. Whenever Mo and I get irritated with the game and its foibles and failings, we remind ourselves of all the friends we’ve made and the fun we’ve had and remember that the game itself is not to blame. Finally, to mark the end of our South African adventure, I’ll share my paddle at the Cape of Good Hope, the most south-westerly point in Africa, not quite where the Atlantic and the Indian Oceans meet but near enough. I had the clubs with me but it was dark by the time we got to the nearest golf course. 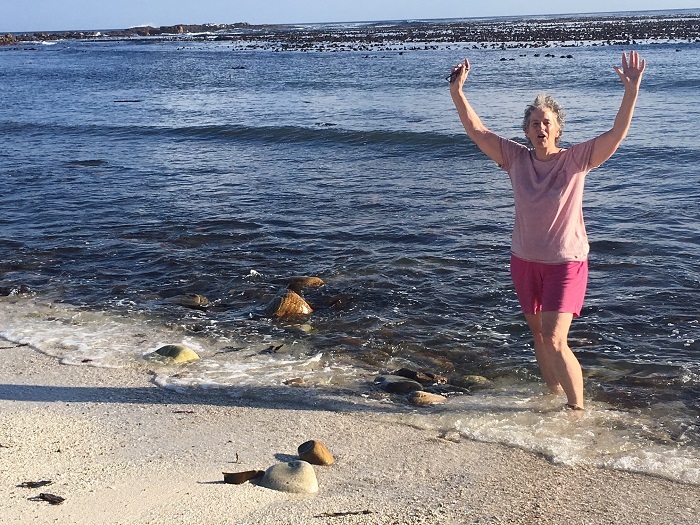 Vasco da Gama eat your heart out……Patricia paddling at the Cape of Good Hope [Pic by Pam Valentine].